We'll use this thread for official updates, directions, and documentation for the F series PWG N55 ISO firmware. Generally 2013 335i models and other F series PWG vehicles like the 2010-2013 F10, and some M135 and M235 models. This BETA firmware and related JB4 board modification is suggested for F series PWG vehicles running larger than stock turbos, or those running stock turbos, who like to experiment. 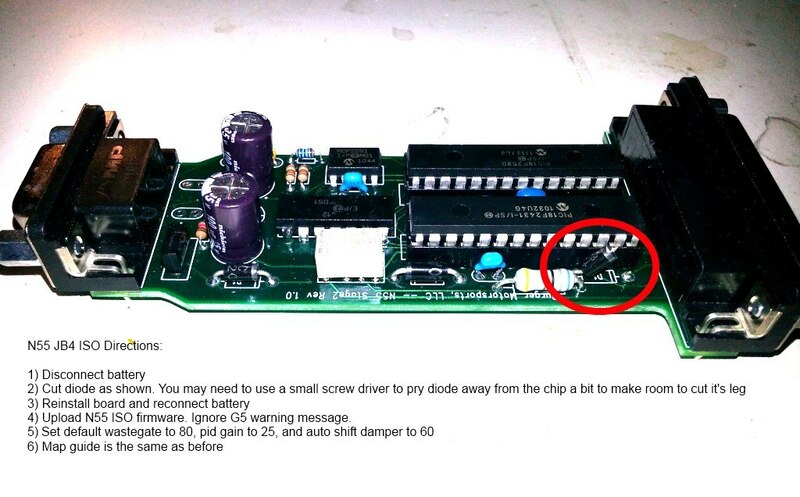 1) Diode must be cut on board to upgrade to PWG F ISO firmware. Cut diode first. See photos below for where it's located on V1 and V2 boards. 2) Settings must be adjusted when upgrading to PWG F ISO. Enter default duty bias settings below, change PID gain to 25, auto shift reduction to 60, FF to 100. 3) Duty bias will adjust itself so the JB4 can learn your vehicles wastegate as you go, expect to see the numbers change on their own as you do more runs. 1) Fixed bug causing under boosting at lower throttle in higher gears. 2) Added menu9 in dash for base dutycycle, and menu10 in dash for pedal mapping. Default on menu9 is 1800rpm but experiment with higher values to get boost response on. Default on menu10 is 0rpm but we suggest playing with higher values to improve pedal response. 3) Removed pedal mapping from 6cyltiming field on interface. T2) Fixed bug with pedal mapping setting not saving. T3) Fixed bug with FF not ramping up as high as ISO_10 for same settings. Default FF setting is now 100. 1) Added logic to autotune duty bias by RPM. 2) Update to prevent startup sweep coming up randomly. 3) Fixed speedo calibration for in dash menu system. 4) Added option 2/2 for boost on fuel & meth on speedo ring. 5) Adjusted some of the PID tables to try to stabilize boost. More changes probably needed here. T6) Adjusted FF scaling by gear to reduce high gear over boost situations. T8) Fixed possible bug with fault code reading. T8) Put back FUD.2 to disable learning if you ever need for testing. T8) Adjustment to duty bias learning algorithm at lower RPM. T9) Fixed bug with boost by gear not always limiting boost target properly. T13) Added FUD.6 setting for cars equipped with a back end flash map, set to 1 to enable. Adjusted map1 and map2 for cars equipped with a BEF. 1) Redesigned logging engine for much faster sampling of all CANbus channels. Normal speed logging is around 10hz for all CANbus channels now, and slow speed logging remains an option for cars with older software and drops sampling down to around 6hz. 2) Removed FUD.5 option. Logging is always full time active now if JB4 is enabled. 1) Updated port injection mapping, fuel enrichment values of 0 now disable port injection all together. 1) Mapped FutureUseD bit4 so that a value of 0 prevents JB4 from targeting below the factory boost target (default setting for those running a factory back end flash map), and a value of 1 allows the JB4 to target independently of the flash boost boost target (useful for back end flash maps with higher targets). FutureUseA: 0-50 offset target between DME_BT and ECU_PSI under full load. A setting of 0 runs the default value of 30. Lower values will result in ECU_PSI closer to DME_BT with more throttle movement, and higher values ECU_PSI further way from DME_BT with less throttle movement. 6 Cyl Timing: Remapped to represent gas pedal aggressiveness. A value of 0 being the least aggressive and a value of 50 the most aggressive setting. Toggle between flap open, flap closed, and OEM operation, by pressing the button for 2 seconds and letting go. The left blinker will flash for valve open, right blinker for valve closed, and both blinkers for OEM operation. The valve setting is persistent and will remain in effect until you change it. If you hold the button too long you'll jump in to the in dash menu system below. '0 map menu, map shown on tach. Note map guide above. '4 Delete Fault Codes, delete = tach 1000. '6 1st gear boost limit setting. 0-5000rpm = 0-20psi. Last edited by dror135; 05-31-2017 at 01:54 AM..
You click FutureUseD and there are yes/no prompts. but on laptop There is no option "Turn on CANbus logging full time"
This is great to see. What is the main benefit of using this firmware... better boost control for PWG turbo cars? Terry - do you think there is a benefit using this with maxed out stock turbo setup? So I've been having boost issues within the past few weeks. I was gradually losing boost which caused "boost level below expected" codes. So I went ahead and did this mod and downloaded the firmware to see if anything would change.. Now I have less than 3psi throughout the RPM range lol. Once I take the jb4 off, the car drives fine again. At first I thought I was losing boost from a mechanical leak such as the chargepipe or diverted valve. But now I'm leaning more towards the jb4. Possibly my settings within the Bluetooth app?someone help, I'd love to have full power before bimmerfest this weekend lol. My pwg f30 is fbo btw. Feature Request - As discussed in email with you and Steve, the ability to read "E" Content from physical sensor as DutyCycle on this firmware for those running PI and "E" Sensor. 2013 F10 535i N55 PWG, Pure Stage 2, Wagner FMIC, ER Charge pipe, ER **, BMS Intake, JB4, Fuel-It Stage 2 LPFP, Fuel-It Platinum PI Kit, BootMod3 Flash, Remus Exhaust, Custom In-let, N20 TMAP. Yes, I'll start adding the logic to this firmware. For those with boost problems send in logs so we can work on it. At some point I'd like to retire the F series PWG integrated firmware. Sorry for the ignorance but I've never sent logs.. I'm guessing WOT 3rd and 4th, gear map 4? Im having issues with my recent jb4 install (by performance centre sunderland) i will get a log tomorrow and send it over im really hoping you can shed some light. this is the graph from map6, as you can see its not great. ok so I just downloaded the newest ISO 7 (T3) and the car finally builds some boost again but it's still nowhere near what it was pushing before. Who/where do I send logs to? Unless you loaded the BETA F series ISO firmware it has nothing to do with this thread. Post the JB4 logs and info in the support forum for tuning help. This thread is fine for now just to keep the F series ISO logs in one place. Later, we'll go back to normal support forum only log rules. Here's my first log.. let me know if I did anything wrong. I wonder if you have a boost leak going on? In any event change FF to 120 to speed up adaption and do another similar log. Will do. I checked and double checked the intercooler connections and chargepipe . Ddnt find anything loose. What will be the benefits of doing this? You'll need to do a proper leak test. Add pressure to the intake tube and listen for leaks. Also when doing logs then do a pull from 2000 to 6500rpm in 4th gear - remember DSC OFF. I'll try to get that done asap, thank you! And Terry, thank you again! Can you confirm/post the non-bit values for FUD so we can use the app? Logs and shifts look OK to me?